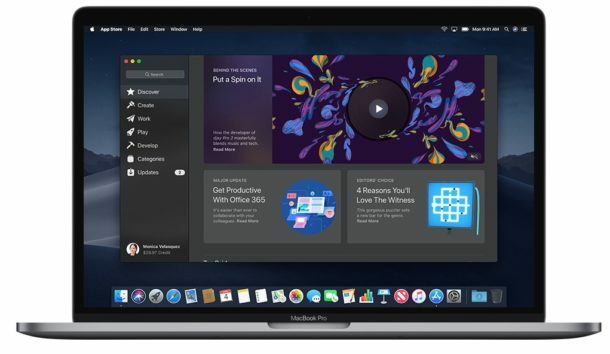 Apple has unveiled macOS Mojave at the annual WWDC 2018 conference, and as usual the developer crowd gains first access to beta system software. Any Mac user who is enrolled in the developer beta testing program can now access and download macOS Mojave developer beta 1. You will need one of the Macs compatible with macOS Mojave to be able to install the system software. Current Mac developers can download the macOS Mojave beta installer from the Apple Developer Center. After it has been installed, updates to macOS Mojave beta will arrive from the Mac App Store as usual. It’s possible that anyone with access to the macOS Mojave beta installer will be able to install the software on their computer, but that is generally a bad idea as the release is intended for developers who are testing their applications for compatibility with the beta versions of the operating system. Early beta system software is notoriously unreliable, and thus it is not recommended for most users to install the Mojave developer beta on their Macs, and certainly not to install on a primary workstation or production machine. Always back up a Mac before installing any system software update, and particularly when running beta system software. A public beta of macOS Mojave is likely to debut in the coming months as well. If you’re a more casual user and you’re interested in testing out MacOS Mojave, it would be better to wait for the public beta version to arrive since it will likely be more stable than the initial early developer beta builds. Developers also have access to iOS 12 beta 1 along with the first betas of watchOS 5 and tvOS 12. MacOS Mojave includes a variety of new features, along with a Dark Mode interface option, and is scheduled to be released this fall. You can download the macOS Mojave beta profile access utility from the following website, or a developer can send it to you. I want Dark Mode, but I have read the early beta version is slow buggy and choppy with bad performance, so I think I will wait until the performance is better. By public beta it should be better. Really, the only problems I’ve found so far are: Adblock Plus and my favorite screensavers cannot be installed. All the others stuffs running smoothly. The system itself is perfectly stable. Same here, minus I can’t shutdown or restart my MBP through software means. I end up with a message saying ‘/ is busy; waiting for lock’ or something of the like. You can download macOS Mojave beta profile from Apple with a developer account. If you know a developer, that developer profile will install on any Mac if they send it to you. Also that developer access profile is the same way anyone can install the beta, and they are ubiquitous on the web. I would NOT recommend installing the but they are available widely. I would recommend everyone wait for Public Beta. That is if you have a “paid” developers account. Otherwise, you don’t see the releases. And why are you running an article that would only insult a true dev and only entice novices to get them in trouble “if” they can get the release. Because of Free Will. People have the choice to do as they wish. Can one dual boot side-by-side MacOS versions?